London West, UK - Inviting Tony Chambers of Wallpaper magazine for his curated picks, in the catalogue of Tuesday's modern design sale at Sotheby's Bond Street, was one cute piece of marketing; the other was naming the sale simply 'Design'. A collection of four cupboards and eight cubby holes, labelled for maker Rudolf Rasmussen, failed to sell at £7,000 low estimate. Mogens Koch (1898-1992) was a rationalist architect and furniture designer, follower of master cabinet maker Kaare Klint, and from 1950 to 1968, a professor at the Royal Danish Academy of Fine Arts. The bookshelves made efficient use of space and purpose while being aesthetically pleasing, using as little material as possible. 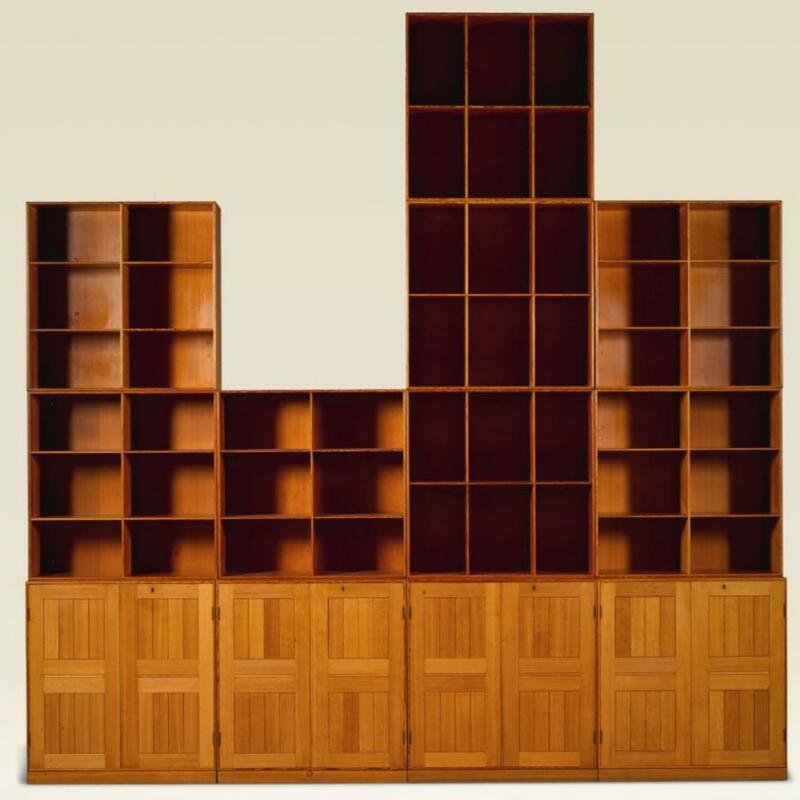 Simple two-door 76cm (30ins) square cupboards (the Danes changed to metric in 1907) and cubby hole shelving, catalogued as a 'modular storage system' but normally called a bookcase, was a 1928 design originally for Mogens Koch's own Danish home but also to be sold individually. Many of the sculptures of Pierre Sabatier (1925-2003) were made under the one per cent for art law in France which stipulated the percentage of the budget of a public construction project that had to be consecrated to a work of art (eg see link below with narration written by his daughter Veronique). 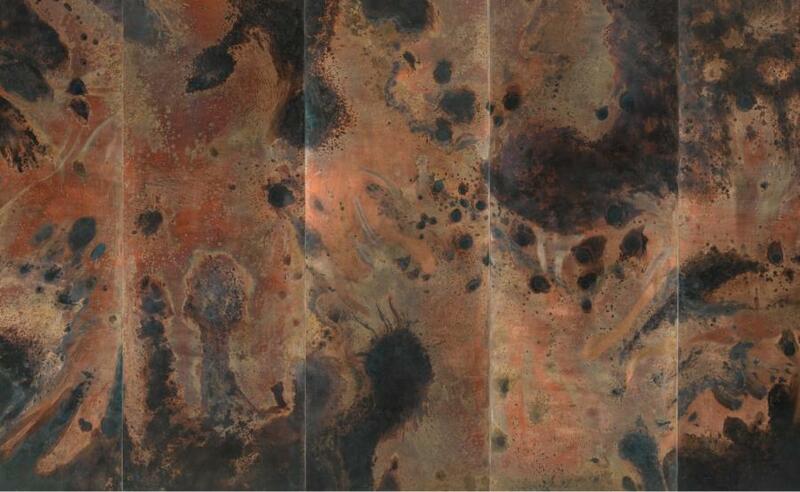 Five wall panels of thick patinated copper made for the Louis Dreyfus bank in Paris, each 257cm by 89cm by 3.7 cm, c1970 sold for a mid-estimate £50,000 (inc buyer's premium). The Chartres cabinet by Job Smeets and Nynke Tynagel of Studio Jobs, based in Antwerp and Amsterdam, is made from polished and patinated bronze, marquetry of French oak, ebony and gold, handblown glass, 169cm high the cupboard doors are the shape of the floor plan of the cathedral behind which is a black model of the church itself. It sold for a mid-estimate £87,500. 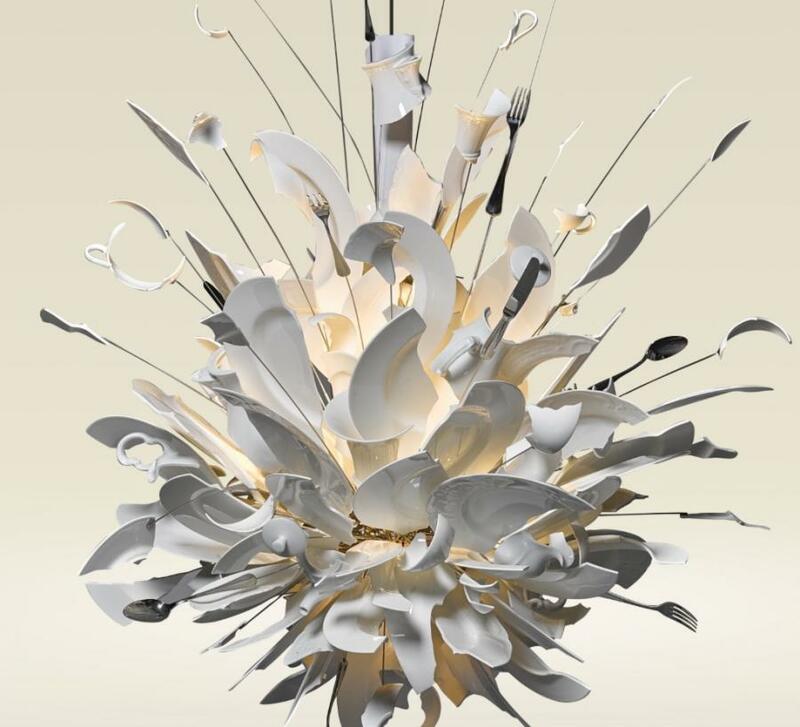 Second highest lot was a pendant lampfitting of an explosion of crockery and cutlery by Ingo Maurer entitled 'Porca Miseria' and made for Villa Wacker on Lake Constance. The interiors of the 19th century villa were revamped by German architect Bruno Paul, one of the founders of Jugendstil. The interior of the kitchen called for something dynamic. Maurer first called the work 'Zabriskie Point' from an explosive slow motion scene in Michelangelo Antonioni's film. The lot sold for a four times estimate £118,750. A total of 79 out of 148 lots sold in the auction for a total of £1,981,375, an average of just over £25,000 per lot.